Take a careful look at the chart below showing the ethnicity estimates of four people based on their autosomal DNA testing. All four were tested at the same company, all four analyzed against the same reference populations. You can click on the image and look at it in a bigger form to study it better. Maybe it will help you to see it in a tabular form. Now ask yourself: what’s the relationship (if any) among these four people? Because all four of these people are full blood siblings, definitively established by DNA testing. Now we’ve seen this sort of thing before. I posted about the wide variations among my aunts and uncles who’d tested.2 It’s simply not possible to identify our exact ethnic origins based on our DNA in any way that’s really reliable below the continental level (Europe versus Africa versus Asia, for example). Let me repeat, one more time, what the limits are of these estimates: these estimates take the DNA of living people — us, the test takers — and compare it to the DNA of other living people — people whose parents and grandparents and, sometimes, even great grandparents all come from one geographic area. Then they try to extrapolate backwards into time. Nobody is out there running around, digging up 500- or 1,000-year-old bones, extracting DNA for us to compare our own DNA to. It’s fun stuff, for sure. Because I’m person 2 in this image and this chart. And though I don’t look much like the others in terms of ethnicity estimates the other three really are my full blood siblings. Thanks for this! To date I’ve only done DNA testing for myself through Ancestry.com, but I just ordered tests for my parents and a cousin. I’m now VERY intrigued to see what the results look like in respect to my own. I envy you the ability to test your parents… these autosomal tests weren’t available until long after both of mine were gone. So sad. I had to use a first cousin once removed for my paternal DNA several years ago when I requested DNA from ancestry.com. I haven’t placed heavy reliance on it but then it hasn’t returned any matched we could go with anyway. I keep hoping that we will actually Connect some dots some day. If you tested the YDNA at Ancestry, they’re not doing that matching any more. You might want to retest at Family Tree DNA. My two siblings and I have been tested, and my brother came out with some Middle Eastern ancestry that neither my sister nor I have. I tend to think that these are more for fun than anything else. Since the basis of them is so ancient, I’m not sure what practical value they have. Though my ancestry is 100% German, I have the British Isles in my report — but where would I even start looking for an ancestor over there? Fairly large numbers of Scottish mercenaries settled in Germany, France, Sweden, and other European countries, and intermarried. There were also both Irish and Scottish peddlers who roamed throughout Europe, so there’s a good chance you have some of those in your ancestry. Or, of course, the other way around — the borders throughout Europe were porous, to say the least. I tested with Ancestry, FT, and 23andme. Results very close. Brothers results vastly different percentages. THIS! This is why I love your blog so much. Straight up truth we can use bottom lined and clearly presented. No one does DNA like you do, Judy. What’s so very valuable about autosomal testing is the matches, Ann, NOT (repeat: NOT!!!!) the ethnicity estimates. Finding that cousin out there who has the Family Bible or the one existing photo of the great grandparents — that’s what it’s really good for. NOT for ethnicity. Yes, absolutely, matches are the main goal of DNA testing. I see the same divergence in results among siblings regardless of the admixture calculator used. Simple fact is, these are estimates. NOT take-it-to-the-bank evidence for changing your lederhosen for a kilt. Thank you Judy! This needed to be said in a clear and precise manner. It is what I love about your blog the most. I read it every day, because it is always absorbable. I have attached a link to this in my newsletter and on my facebook. I am a huge fan! Thanks for the kind words, Lil! Someone once explained that DNA distribution among X number of siblings is like someone ladling out X number of bowls of beef stew. Even if the volume of each scoop is the same, if you analysed the composition of each bowl, you’d find one with more meat, one with less potatoes or carrots. Nature just doesn’t distribute the ingredients equally. But if you found something like anchovies or bananas in one or another, you might want to consider “tampering” (aka NPE). Your results could be those of my 3 siblings and myself…and I’d wondered about the big differences. Thanks for your analysis–it was very helpful! No one could have come up with a better example than this of the pitfalls of assigning the results of DNA tests to specific geographical areas, or even more foolishly, to cultural groups! Or to write so well about it. Thank you, Judy. DNA has a role, but this is not one of them, especially with our current limited understanding of the migration and mixing of various groups of humans. My family’s autosomal tests are not too dissimilar to yours, with varying mixtures of British, Scandinavian, and Western European. No middle-eastern or asia minor at all. But my brother’s YDNA is one that is common in the middle-east overlapping into Africa (based on current populations) though also found scattered in Europe. Our mtDNA (one test standing in for us all) has strong Finnish affinity. My take on that: people have been moving around for eons. We are a mixture, all of us. Looking at these percentages gives tantalizing clues about the movement of populations, especially as we learn more about ancient DNA, but even that is tentative, because the samples are few and far between and we have no way of knowing how representative most of them are. As for applying them to individuals today, after centuries of massive global migration and intermixing? Fun to think about, but not very illuminating. These are definitely fun things to look at. It’s just that people really want to get it down to the “I really do have 0.67% Native American!” level — and … well… um… no. Judy – another very well explained post! Thanks. With your permission, I’d like to use your table of 4 in my presentations on DNA (I only have one sibling – he has tested, and results are as dissimilar as yours). In addition to the reference populations not being truly representative, each sibling gets only one half of a parent’s DNA, 1/4 of a grandparent’s DNA; etc. But which portion did they get (and each sibling gets a different mix) By the time you get back several hundred years, each sibling has a randomly different, small percentage of the different ancestors. Even if the reference populations were perfect, we’d only get a fraction of the real ethnicity picture, and each sibling would certainly be different. As you say – ethnicity is not a strong part of our DNA results. You have my permission to use it, Jim, and thanks for asking! My husband, and 2 of his older brothers all took the test on Ancestry. Now their father was pure 100% Irish with O’Brien, etc. names in his tree. However, the tests came back with Brother A being 61% Irish, Brother B being 54% Irish and my husband being only 42% Irish. Guess it just depends on what you get from each parent. Definitely not 50% from each as once thought. Oh, all three boys got 50% from Dad — but they sure didn’t get the SAME 50%. And — if we believed that these percentages were 100% accurate — we’d go off looking for where the 8% non-Irish was. That’s when we need to stop and remember that the percentages are NOT 100% accurate. I think I will use it (with your permission). Thanks for this post. I always tell people that these reports are interesting, but not always accurate. For myself, I’ve tested at 23andMe, AncestryDNA and FTDNA, and my reports are different at all three (only slightly different between 23andMe and Ancestry, but significantly different with FTDNA). I don’t have siblings to test, but I am in the process of getting my maternal aunts and uncles to test. At present, I’ve got one aunt and two uncles tested, and one uncle whose test is now being processed. Of those, one of the three has over 60% Scandinavian, while the two siblings are less than 40% Scandinavian. One has Jewish ancestry, the other two do not. It’s going to be interesting to see the results for the more recent test. This kind of testing and results are a lot more improved over what they were back when 23andMe first began reporting it, and that’s mostly due to better and more populations samples. But, as you point out, these are still population samples coming from living people, and not from the DNA of bones that have been unearthed and tested. One of my siblings is in the six week wait period. I understand that our DNA is a random mix from each parent which is a random mix from their parents. If only one Grandparent was Irish then each current generation sibling might or might not have that Irish representation. I don’t see a discrepancy with each current generation sibling having different ethnicity percentages. I would expect some cousin matches to overlap and some cousin matches to be distinct to each sibling. There is a difference between heritage and inheritance. Four siblings may share the same heritage, but each sibling inherits DNA that is not the same. DNA contains information that predisposes us to particular health and traits. The better question is, if your actual genealogical heritage takes you back to Ireland and then Scotland, but your DNA doesn’t show it at all, are you still Irish or Scottish? Of course you are. The random way that DNA is inherited plus the fact that we don’t know enough about what aspects of DNA really mean you’re Irish or Scottish makes ethnicity estimation a really silly way of defining ourselves. The different terms were intended to point out the meaning changes depending on context. I believe the response you gave was in the context of heritage. Since we are discussing DNA, this seems more appropriate to inheritance. Since 23andme is focusing on health and traits, it is reasonable to assume their research looks for common health and traits in common to particular ethnicities. If a doctor asked you if you had any Scandinavian blood, because the symptoms are common to people with Scandinavian blood, I might not be so quick to say no. You also presume that your family tree has no Non-Parental Events. This means that the birth certificate may name the husband but was really conceived by another man, with a different heritage. I am not saying you should hang your hat on the ethnicity estimates being correct, but I certainly wouldn’t completely dismiss them either. The point is that every ethnicity estimate is a statistical guess based on comparisons to very very small reference populations that may (and may very well not) bear some genetic relationship to the population they’re supposed to represent. Except in areas where the genetic signature has been stable for generations, the reality is : we’re all mutts. So with the exception of those very distinct populations then beneath the continental level these are cocktail party conversation starters. I have done my own autosomal testing through Ancestry and I felt it was pretty accurate. I am 100% European – my mom was 50% Polish and Ancestry says I am 24% Eastern European, and the rest was 44% English and 22% Irish. Based on the research I’ve done this looks about right. When transferred to FamilytreeDNA they were less specific – 100% European! My son’s test done only with FamilytreeDNA showed 85% European and 15% Ashkenazi Jew. His father is in the process of having his autosomal DNA tested as I write…His Y DNA did turn up in a haplogroup common in Jews and the people he matches are all Jewish. Since the paternity of his father was always questioned we now have confirmation which man it was! Some people get very close matches between their paper trail ancestry and the estimates shown by analysis of their DNA. Others … well… not so lucky. I agree, it’s about context. I have lately gotten into the habit of saying, I identify myself as 25% Irish *culturally*, even if I am only 7% or whatever per the DNA (and the testing company’s current algorithms/calculations). I have very clear classifications in my head that are not going anywhere anytime soon — I have a fully Sicilian grandmother and a fully Irish grandfather — as in their parents and before were all from the old countries. And I’m viewing any ethnicity estimates in the range of less than 1% to 3% as noise at this time. The ethnicity estimates are only valuable as a novelty… And for my (half) brother, if he wants to believe he’s a Viking. What I notice looking at the percentages was wonderful information that it gives about your family and your parents. By looking at your parents together as the head of the family. Here what I see as the ethnicity of the family as a whole according to the estimates. I am sure that rest of your full blood siblings should confirm these percentages are close. 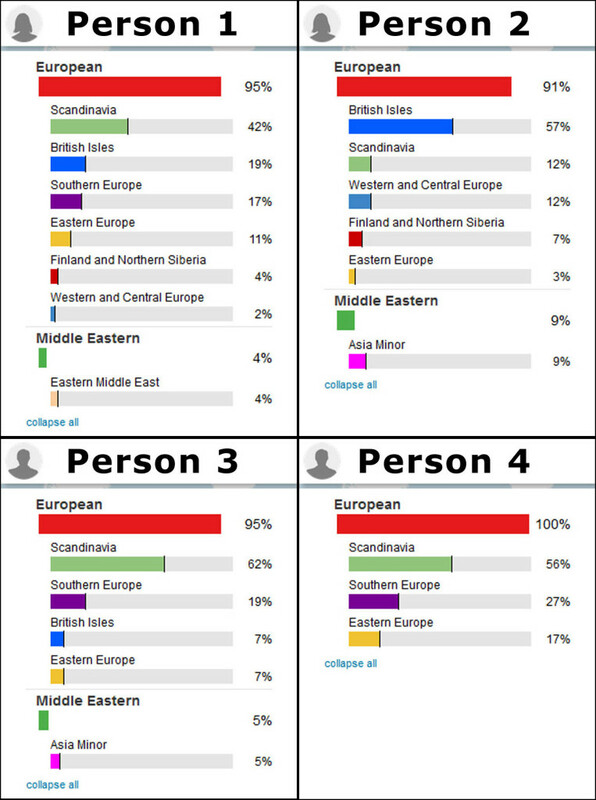 Ancestry shows that I am 1% Scandinavia and Family Tree DNA show that I am 26% Scandinavia. So, it all comes down to what their control groups are and how many have been tested. No question. But that’s only part of the story. The key here is that these estimates are statistical guesses based on comparison to very small reference populations of living people. Your results are NOT being matched against ancient DNA. Thank you for posting on this once again. I think it is so important as new people enter into genetic testing and so many do it for the touted ethnicity results – especially Ancestry. I continue to forward these messages to friends when they test and want so badly to believe those results and send links to people posting about them on the JewishGenDNA digest. Have fun at the conference. I signed up for Live Streaming. Thanks, Carolyn! The conference is amazing — can’t believe we have just one more day. That would be likely in my family :)… but no, full blood siblings, proven by DNA. Just thought of something. So what do we tell our kids? For instance, if I know my Grandmother was born in Scandinavia and say I didn’t get the dna. Do I say they AREN’T Scandanavian? Or do I say something like it is in the family tree but you won’t have it in your dna.Thank you. A cousin on my Dad’s side had his DNA tested as did my brother, sister & uncle (Dad’s brother) and myself. All 4 show up on each others DNA MATCHE? I DO NOT! Does that me that the man who I thought of as my father is not my father. He and my mother are deceased now, I am 65 years old so at this point it doesn’t matter except I would like to find out who my father was genetically and do I have any half siblings. This may a situation that my Mom wasn’t sure of parentage and it went to the grave with her. But I am still alive and I am curious. Thank you. Deb, tried to answer by email, but the address you left bounced. So… how long ago did you test, who did you test with, what test did you do, and are you saying you don’t match your brother or sister AT ALL?